DraftSight offers users a new and improved way to create, edit and view DWG file formats. This application has been created as a professional grade open 2D CAD product for people who need to improve the process of creating and later on editing and viewing of DWG files. It features user friendly interface and it can be used by both beginners or students and professional CAD users or educators. 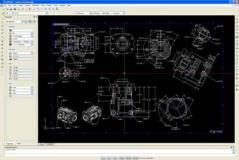 The program allows users to easily make professional CAD drawings and with the DWG format as a primary drawing file format and support for DWN and DXF files up to version 2010, this tool offers compatibility and allows for exchange capabilities with all kinds of graphics and construction design programs all around the globe. With DraftSight you will be able to easily build, manage and look at your own design. Minimal system requirements are Intel Pentium 4 processor with 2 GHz or faster, 300 MB of free hard disk space, at least 1 GB of RAM, a High Color at least 16 bit graphics card and display that has support for at least 1024 x 768 resolution mode. DraftSight is available for Windows, Mac and Linux operating systems and all users have access to extensive online community support that features an abundance of learning resources. New versions of the software are issued once a year.